Cherries are Christmas to me, and they star in this dessert, though you can add white peaches, nectarines, apricots, mango - any or all the wonderful fruit we have at this time of the year. You can also add some texture with no fuss. Try roasting slivered almonds, smashing up gingernut biscuits or buying meringues, crushing and sprinkling over the dessert. 1. Put the cherries in a bowl, sprinkle with sugar and mix gently. Macerate for an hour. 2. For the mascarpone sabayon, use an electric mixer with whisk attachment to combine the sugar and yolks. Mix on high for about five minutes, or until the sugar has dissolved and changed colour from yellow to white. 3. In a small pot, heat the cream until just before boiling then slowly pour into the egg and sugar mix and keep whisking for a further two minutes. 4. Remove from mixer and place into a large bowl over a water bath on the stove. Whisk continuously over medium heat for five minutes or until the mixture becomes thick like whipped cream. 5. Remove bowl from heat and place over an ice bath to cool down quickly. Once cooled, whisk in the mascarpone until smooth. Refrigerate until ready to serve. 6. 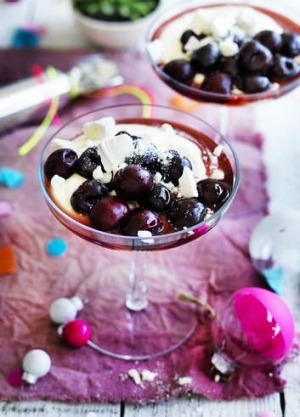 To serve, spoon the cherries into a martini glass or any nice looking glass and spoon on the mascarpone.